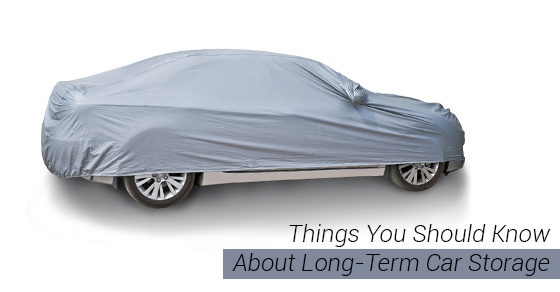 When it comes to protecting a valuable car during the harsh winter months, or if you are going away for a long period of time, long-term car storage is a great way to keep your vehicle safe and secure. Many people use long-term (which generally means a month or longer) car storage to keep classic and collectible cars safe over the winter months, protecting them from elements such as snow, sleet and salt. Long-term car storage is also a great option for those who go away for long periods of time and have no need to bring their car. And for those who own multiple cars, you may just have run out of storage at home! Storing a car with any fluids, including oil and gas, empty can damage your engine. Before putting your car into storage, make sure all fluids are topped up. This includes an oil change and a gas tank that is at least a quarter full. This will prevent moisture and other contaminants from getting into the tank. You will also want to fill your tires with air, and, if storing the car for a year or more, place jacks underneath the tires to avoid any flats. Before putting your car into storage, make sure it is deeply cleaned, both inside and out. Washing and waxing your car pre-storage will keep the paint safe. You may also choose to have your car professionally detailed. Make sure the inside of your car is clean too! Any trash or perishable items will make for an unpleasant surprise when you take your car out of storage. A waterproof cover is your best defence not only against the elements, but also again any pests or debris that could damage your car. When covering your car, make sure the gas pipe and any other openings are securely covered to prevent any little critters from turning your car into their winter home! Comprehensive storage of ALL vehicles including trucks, RV’s, boats and cars. High security including camera monitoring, an alarmed gate and onsite security. A limited number of block heaters. Click here to learn more. Space is limited, so plan ahead.